In their 40th year anniversary, UFO returns with their 20th studio album, The Visitor, their third in Mogg/Moore era. As of this writing, the gravely underrated and proficient Andy Parker is back behind the drum kit, and the longsuffering bassist, Pete Way, may be on the way out due to his failing health. 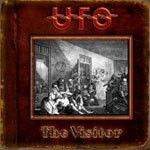 On The Visitor, UFO continues their trend of more blues oriented hard rock then metal tinged melodic rock of the early days. This trend began as early as the 'Covenant' album during the second Schenker era, but probably has its true roots in the Mogg/Way albums that preceded it: Edge Of The World and Chocolate Box. It was definitely solidified with the first Moore-era album You Are Here, an album that garnered well deserved international praise. The blues motif affects more than half of The Visitor with a greater extent on Saving Me, On The Waterfront, Rock Ready and to a lesser on Living Proof, Villians & Theives, and Stranger In Town. Of the former, the best are thick and earthy Saving Me and Rock Ready. On The Waterfront draws the same comparison, but may be more difficult to digest as it is closer to hard blues than anything else on the disc. Honestly, I had to listen to it several times to truly appreciate its character. Of the latter, Hell Driver, Villians & Theives, and the heavier Stranger In Town finds the band delivering some stick-to-the-ribs guitar chops over a toe-tapping groove. Throughout The Visitor Moore creates inspiration on his fret board and Mogg twists and turns words and phrases in his usual fashion of blurred and mystic storytelling. Although, Mogg sometimes reruns some phrases from the past. Irregardless, these two fellows work as well together as Jagger/Richards or the Toxic Twins. It's all very, very good. The Visitor is another entertaining platter of current UFO: blues-laden melodic hard rock. The Mogg/Moore era continues and the train keeps a rollin.' Great stuff. Highly recommended! The Visitor is another entertaining platter of current UFO: blues-laden melodic hard rock. The Mogg/Moore era continues and the train keeps a rollin.' Great stuff.